Are you looking for Daily Nation News from Kenya, up-to-date commentary or new developments in local politics? How about sports or business news....or even fashion? Do Kenyan Cartoons pique your interest? You can find it all here. Interested in buying property in Kenya,(the real estate in Kenya still has a lot to offer), or looking for a place to rent? Would you like to advertise something, search the yellow pages? Need to send some money? Well, this is the place. Are you planing on an extended stay, looking to do business in Nairobi or Mombasa, or are interested in learning more about this part of the world? There is simply no better way to get a pulse on what is happening locally and nationally in any area of life in Kenya than to start with the Daily Nation on the Web news. Once there you have the option of clicking through to "The East African" news link, which will give you yet another perspective on every day events. This East African section is published weekly by the Daily Nation Group. For weekly activities see the Leisure, Entertainment and Sports sections. The Daily Nation also allows the readers to interact with others through Discussion Forums and also gives the opportunity to comment on articles. Please find the following links for more Kenya News. These are all excellent sites, that also provide numerous more Africa News sources and also World News Networks. AllAfrica Global Media is a multi-media content service provider, systems technology developer and the largest electronic distributor of African news and information worldwide.This website is among the Internet's largest content sites, posting over 1000 stories daily in English and French and offering a diversity of multi-lingual streaming programming as well as over 900,000 articles in their searchable archive. 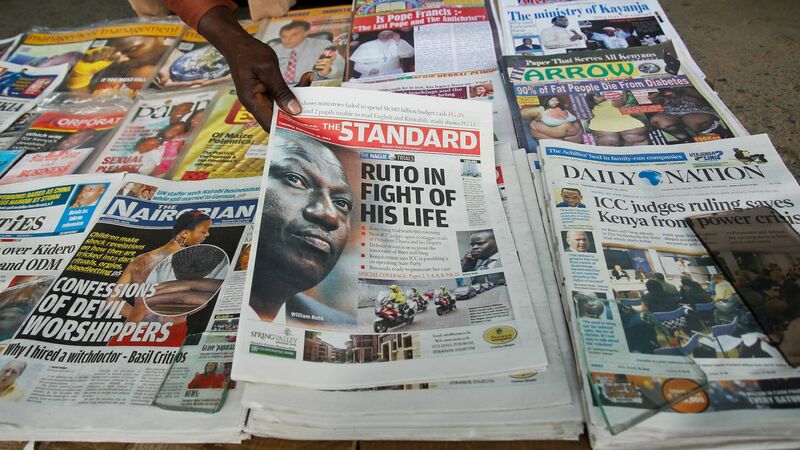 The Standard is all about Kenya News and is a direct source of all the current events in all of Kenya. Africa Business Daily will get you direct into this general area about Africa through the WorldNews Network. Kenya Daily is the direct link into news from Kenya trough the WorldNews Network. Kenya News.Net is an online news service with news from many different sources, which makes it easy to get a good overview on the latest updates.